William isn't allowed to have stuffed toys due to the fact that they last no more than 20 minutes before the stuffing is torn out in a big fluffy mess. Unaware of this, my parents bought William a toy snake for Christmas. The snake seemed promising due to claims made by its creator to be indestructible and long lasting. We should have known better. When William was presented with this toy he took it to the backyard and raced up and down with his new prize in his mouth. These pictures depict the last hour or so of this snake's life because shortly after its head was ripped off and the stuffing began to ooze out! 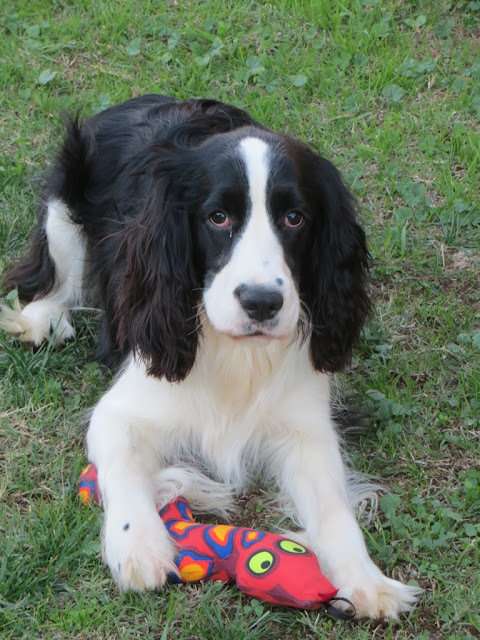 Please let me know if you have any suggestions for toys which actually can withstand the force of a 50 pound springer spaniel puppy who is a ball of energy. The encounter between William and the snake sort of reminds me of those Japanese science fiction films featuring giant monsters such as Godzilla or Morthra. In fact, now that I think about it, William has successfully battled many other "monsters" in classic Godzilla style including a moth in our kitchen ( following the moth and trying to bite it kept him occupied for hours) and one of his first stuffed animal, a gigantic lobster which used to be bigger than him. 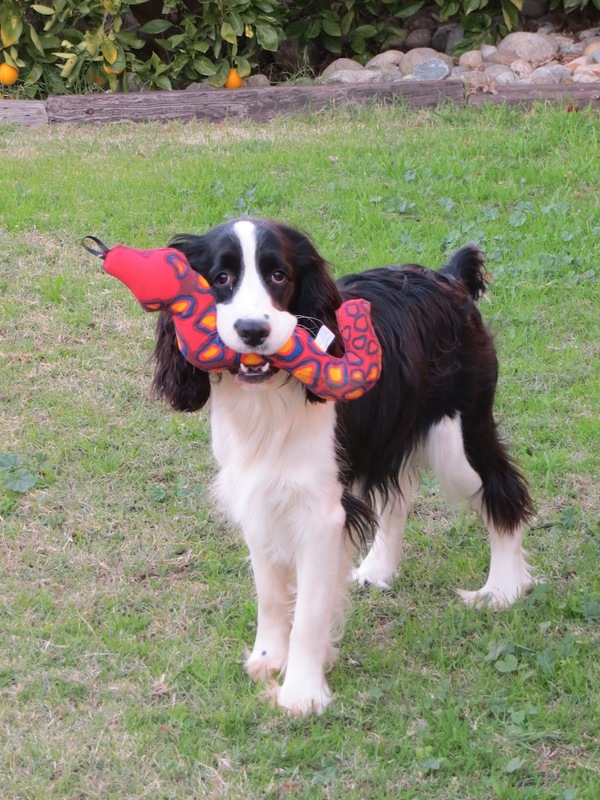 I can just see the tag line to such a movie now, "William the king of the springer spaniels versus giant radioactive lobster, Mothra and indestructible snake!" What will William take on next? Below are some pictures of William and his toy (now laid to rest in the trash) and William exploring the mysteries of our backyard. As you can see he is really growing up! Thanks! William is a ham for the camera so there will certainly be more pictures to come!